The changes have been subtle and even span generations, which accounts for few people even noticing. Yet, looking back over the history of the US currency, one immediately sees that the citizens have been fleeced! All these issues had the same general appearance, but differed primarily in their obligation to the bearer of the bill. The US Constitution doesn’t contain the words LAWFUL MONEY. But Article 1, Section 10 prohibits states from making “any Thing but gold and silver Coin a Tender in Payment of Debts;” While gold was withheld from the public at this time, silver was still accessible and Silver Certificates were still redeemable for silver coin. The Treasury, therefore, had to keep silver in their vaults in order to keep the promise of redemption. But the value of silver was increasing and people were trading in their certificates for the real metal. The Treasury’s silver was drying up. As the certificates were redeemed, they were destroyed as no new silver was put in the vault to maintain proper backing. Finally, in 1964 the Treasury halted silver redemption. All that was left then, was the Federal Reserve Note, which was now being printed with a completely relaxed obligation. There is no longer any promise to redeem anything on demand of the bearer. Only a statement is made that this fiat paper note is “LEGAL TENDER FOR ALL DEBTS, PUBLIC AND PRIVATE.” Even though there is nothing but more paper backing this bill, citizens yearn for more of this stuff as if it’s worth something more than the empty promises of the issuing government. They might have spruced it up a bit recently, but as the saying goes, it’s like putting lipstick on a pig…. it’s still a pig! It’s a shame that people can graduate from most universities and still not know the most basic facts about money. Everyone wants money but they fail to understand what it is, and how it’s changed over the past century. Thank you for this summary. It’s a quick, effective lesson in the US Government’s gradual, inexorable debasement of money. Alexander Hamilton was an agent for the House of Rothchild. The second sentence here is not entirely accurate. United States Notes also remained after 1964, and were last issued in 1971. Ok, fair enough…. but the obligation statements on the United States Notes were the same – limited to only the ‘LEGAL TENDER’ clause. I heard before about some “very rare” and “valuable” two dollar bills with a “blue seal”, at the time I thought it was impossible for a two dollar bill to be worth more that two dollars, now I know why, those were actually silver certificates! Thank you for a very educationaal presentation. I am Bo Fridolph from Sweden, and I would like to ask if any of you have ever heard about The OHIO 1934 Bond, which should be a serie of bonds involving a Government deal amounting to 10 trilion USD at the time, and these bonds were suposedly mature in 2004, when capital and the componded interest should have been paid. I have a copy (PDF) of one Bond, said to have been taken from an force-opend box, which also destroid the values of all the bonds in that box. I remembered the tale, when I read in your presentation tha something happend with the Dollar 1933-34. It might as well just be one of the legendes traveling around the world! Nice piece. Trying to teach my son about devaluation, thanks for your help. If you do an updated or revised in the future, maybe include something on removing precious metals from coins, just a thought.. Please lose this dreadful black background. It’s a classic web design no no. It makes your site difficult to read. As I understand it, FDR did not take us off of the gold standard although he did nationalize gold (which was bad enough) and we later officially went off the gold standard in the early/mid-1970’s. Never-the-less, an outstanding article with excellent observations and a must-read. A neat piece of history, the history of US money. Money is not wealth, and this presentation demonstrates how these two values have diverged. Now money can be created with the flick of a cyber switch. Wealth not so easily. Great article. However, you left off the “United States Note” issued in 1963 at the direction of John F. Kennedy. The one dollar, two dollar and five dollar denominations were put into circulation before his assassination. 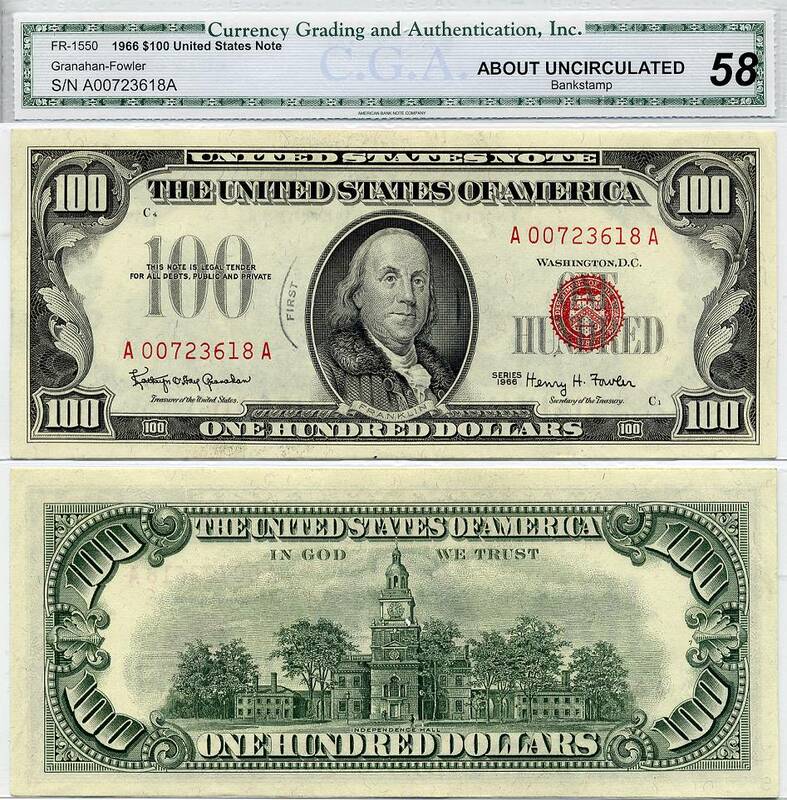 The ten dollar, twenty dollar and one-hundred dollar notes were never issued and the notes that were in circulation were removed as rapidly as possible. JFK was replacing the Federal Reserve Note with the United States Note and thereby eliminating the Federal Reserve’s control over our currency. I have a two dollar and a five dollar United States Note which have red serial numbers and a red seal. He went up against the Banking Cartel and they took him out.